Liliane Stewart, a noted Montreal philanthropist who, with her late husband David and the Macdonald-Stewart Foundation they led, contributed tens of millions of dollars to various arts, cultural and educational institutions in Montreal, including McGill, died Saturday at age 85. 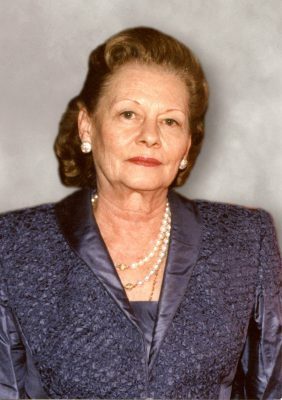 A member of McGill’s Board of Governors from two terms from January 1985 until December 1994, she was made a Governor Emerita in 1995. McGill awarded her an honorary degree in 1999, having bestowed the same honour on her husband in 1978, four years before his death. David M. Stewart was heir to the estate of Sir William Macdonald, who was an important figure in the early years of McGill. Liliane Stewart, a noted Montreal philanthropist who, with her late husband David and the Macdonald-Stewart Foundation they led, contributed tens of millions of dollars to various arts, cultural and educational institutions in Montreal, including McGill, died Saturday at age 85. A member of McGill’s Board of Governors from two terms from January 1985 until December 1994, she was made a Governor Emerita in 1995. McGill awarded her an honorary degree in 1999, having bestowed the same honour on her husband in 1978, four years before his death. David M. Stewart was heir to the estate of Sir William Macdonald, who was an important figure in the early years of McGill. “Liliane Stewart helped shape the Montreal, and the McGill, that we know today,” said Principal Suzanne Fortier. “As a member of McGill’s Board of Governors and the Macdonald Faculty Advisory Board, she brought a keen eye for detail and a deep caring for people. As a philanthropist and president of the Macdonald Stewart Foundation, she not only changed lives, she changed the University’s very landscape. Hundreds of McGill students studied on Macdonald Stewart scholarships. Mrs. Stewart’s funeral will be held Tuesday, May 13, at 11 a.m. at Notre Dame Basilica, and students from Macdonald College will participate in the service. The event will take on military trappings, owing to Mrs. Stewart’s long-time connection with three regiments: the Queen’s York Rangers, the Compagnie franche de la Marine and the Old 78th Fraser Highlanders. McGill’s flag atop the Arts Building will fly at half-staff that day, while the flag at Macdonald Campus will remain at half-staff until then. The Dean noted that Mrs. Stewart continued to provide financial and moral support to many causes at Mac, including Founder’s Day Celebrations. He noted in particular her financial support of larger projects such as the Greenhouse, Ecoresidence, capital equipment, renovation and construction of the Macdonald Library and Learning Centre, as part of Mac’s centenary celebrations in 2006-07. In 2001, the Liliane and David M. Stewart Foundation donated $1.5 million to support water management studies at Mac. “She has left her imprint on our campus,” Madramootoo said. Mrs. Stewart also served as president of the Montreal Museum of Decorative Arts, the Stewart Museum (founded by and named for her husband) on Île Ste-Hélène, and two Jacques Cartier historical societies. The Macdonald Stewart Foundation has also contributed to such institutions as the Université de Montréal and Hôtel-Dieu Hospital. Mrs. Stewart was the recipient of numerous honours. In 1988, she was made an Officier des Arts et des Lettres by the French government, and year later, she was invested as an Officier de l’Ordre national du Québec. In 2007, she was made an Officer of the Order of Canada.